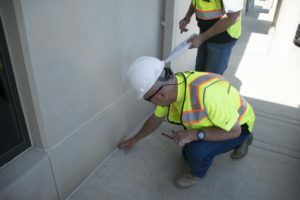 Categories: Building Inspections, Uncategorized // Tags: building inspection, commercial construction, commercial inspections, construction, ground up, ground up construction, inspection, kansas city, property assessement, property condition assessment. Kansas City is in a construction boom. Both residential new homes as well ground up commercial construction are way up. In fact, according to Dodge Data & Analytics, Kansas City ranks 15th in the nation for money spent on commercial buildings and multifamily housing construction. This was a 40% increase between 2015 and 2016. It does not include commercial renovations. With exponential growth comes problems including quality of work, access to materials and a shortage of skilled labor. This incredible growth in construction has resulted in some poor craftsmanship and low-quality installation of materials and product. Nationwide Commercial Inspections, LLC (NCI) has been providing commercial building inspections for many years for real estate investors, brokers, buyers, sellers, architects, engineers, insurance companies and banks. It is essential a comprehensive examination of your new ground up building is done to ensure the owner is getting what they paid for. We concentrate our inspections and reports on five keys areas. Building site – Does the finished site comply with the design documents and does it include any major deficiencies? Was the landscaping installed with quality product that will last for many years? Does the irrigation system have the proper coverage? Does the storm water shed away from the building as opposed to towards it? Even new paved parking lots may have low spots causing premature deterioration of the asphalt. Roof – Numerous items can be missed during the construction of a new building. None of which are more important than the roof. Often the roof was installed properly, but other trades such as plumbers, heating and cooling technicians and electricians make penetration into the roof, thus voiding the warranty. All penetrations have to be made by the authorized roofing contractor. Flashing and counter-flashing may not be installed properly allowing moisture to get into the substructure and insulation below and in the parapets. Building Envelope – This key component of the building is where most problems are found. Improperly installed or lack of joint sealants are a killer for a building. This results in leaks and damage to the inside wall cavity including wall sheathing and insulation. Flashing including sills that are not installed properly or have been missed entirely can have an immediate impact on the quality and performance of the building. Building Codes and ADA – While the installation of the materials and quality might be acceptable, often code issues are missed by the builder, architect, engineer, city building inspector and/or reviewer. The slope of an exterior ADA ramp may exceed the maximum slope or a toilet might be 1” too far away from the side wall. From the average observation, everything might look fine, but without a thorough quality control check, these details often get overlooked. Safety – At first glance, all building materials may seem to be installed properly. As you look closer a window may be missing gaskets, allowing for it to be displaced by high winds causing injury to someone. An exterior canopy may not be tied into a compression fitting or have proper structural backing. It is an exciting time for ground up construction in Kansas City. However, with this economic upturn comes the innate problems of quality and safety. The safety of the public is the most important responsibility the construction industry has and these oversights can have serious consequences. Do yourself a favor and protect your company, investment and the public by investing in a commercial inspection. This small investment will save you thousands of dollars in the future. Your return on investment (ROI) will be off the charts.